Iran's regional allies and some European nations continue to form new plans to skirt a rash of upcoming sanctions on Tehran to keep the hardline regime afloat as protesters continue to push for regime change in the Islamic Republic, according to U.S. officials and experts. Iraqi Prime Minister Haider al-Abadi is the latest regional official to oppose the new sanctions and throw his government's support behind Iran as it works with regional allies and others to avoid a series of new sanctions by the Trump administration aimed at further squeezing Tehran's economy and choking off funding for its terrorist forces. Senior Turkish officials, operating on orders from President Recep Tayyip Erdogan, also have vowed to help Iran skirt new U.S. sanctions. The move represents another turn in the diplomatic standoff between Turkey and the United States over its imprisonment of an American pastor that led the Trump administration to issue new sanctions on Ankara. Senior U.S. officials say that even more sanctions are coming down the pike. As the Trump administration prepares to hit Tehran with a large package of new sanctions on Nov. 5, Iran's regional allies and some European governments continue high-level powwows to figure out a way around these sanctions, prompting outrage in Congress and in the Trump administration, sources said. "We are … working to build a global coalition to counter Iran’s malign activity," a senior administration official said of the new sanctions. "What I can tell you very specifically is that we have made it very clear that we’re going to aggressively enforce this executive order and the other authorities that we have pursuant to statute. We will work with countries around the world to do so. But make no mistake about it, we are very intent on using these authorities. We will use them aggressively." "This is not the Obama administration," said another U.S. official involved in the Iran sanctions push. "The United States expects its allies to side with us against the Iranian regime, which has rejected talks with President Trump and continues to export terrorism and oppress its own people. The U.S. expects Iraq to act like a normal country and, if they choose not to, we will not forget which of our allies sided with the regime against us. You can be very sure President Trump personally knows who is on which side as well." Efforts by Iran's allies and European business partners to skirt sanctions are being thoroughly addressed by the Trump administration, which announced on Thursday the creation of the Iran Action Group. The new body of senior State Department officials "will be responsible for directing, reviewing, and coordinating all aspects" of the administration’s efforts to isolate Iran, Secretary of State Mike Pompeo announced. The new action group will work to "ensure the Department of State remains closely synchronized" with the rest of the administration and U.S. allies to curb Iran's regional terror actions, as well as new sanctions on the country. The group will be lead by Brian Hook, a senior State Department official who has been working with European allies to pressure them to support new sanctions. Hook has already taken high-level meetings with European allies in pursuit of this policy. 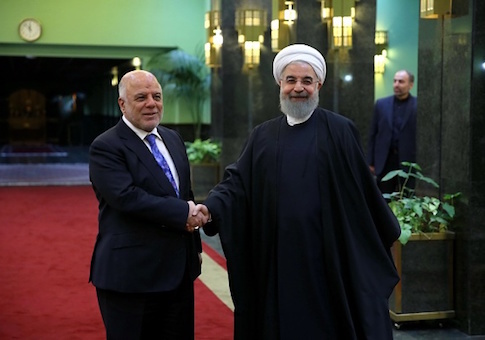 Abadi's latest promise to work with Iran against U.S. sanctions is another sign of the growing ties between the two countries, which have become allies under the prime minister's tenure. Iranian-backed forces have long been operating in Iraq and have obtained U.S. arms in some cases by pretending to be official Iraqi forces. Iran continues to solidify its presence in Iraq, which it considers a key strategic location. Earlier this month, Abadi condemned U.S. sanctions on Iran as a "strategic error" and has since promised to breach them. "I did not say we will abide by the sanctions," Abadi was quoted as saying, explaining he will only refrain from U.S. dollar transactions with the Islamic Republic. Iraqi groups tied to the Iranian government also have lashed out against the sanctions, according to new analysis by the Foundation for Defense of Democracies. "Abu Ala' al-Wala'i, the secretary general of Kata'ib Sayyid al-Shuhada, an Iraqi Shiite militia with close ties to Iran's Islamic Revolutionary Guard Corps, rejected the U.S. sanctions against the Islamic Republic, saying, ‘We are working to break the blockade,'" FDD noted in a recent report on efforts by Iranian allies to skirt new U.S. sanctions. "The militia also vowed to ‘use all available means to prevent the starvation of our Muslim brothers in Iran,'" According to FDD's research. Multiple other Iraqi groups and individuals tied to Iran have made similar comments in recent weeks, amplifying pressure on Abadi to go along with these efforts, according to FDD's analysis. "Iran-aligned political parties also joined in the criticism," FDD noted. "The Islamic Dawa Party urged all nations not to abide by the ‘unjust' sanctions, while former Prime Minister Nouri al-Maliki, a member of Dawa, met with Iran's ambassador to Iraq and vented his frustration with the renewed sanctions on Iran." Behnam Ben Taleblu, an Iran research fellow at FDD who helped author the report, told the Washington Free Beacon the Trump administration must apply its own pressure on Abadi and the Iraqi government to move away from Tehran. "Not only must the U.S. work to pressure and incentivize the current and future government of Iraq to abide by sanctions, but the U.S. must take note of and counter Shiite militia networks which the Islamic Republic could use to engage in cross-border smuggling as the regime attempts to offset sanctions pressure," Taleblu said. This entry was posted in National Security and tagged Iran, Iraq. Bookmark the permalink.